The list was built around having the two heavy hitters, lots of possible Steadfast troops, and support from the 3 ranged threats. Game 1 vs Warriors of Chaos. 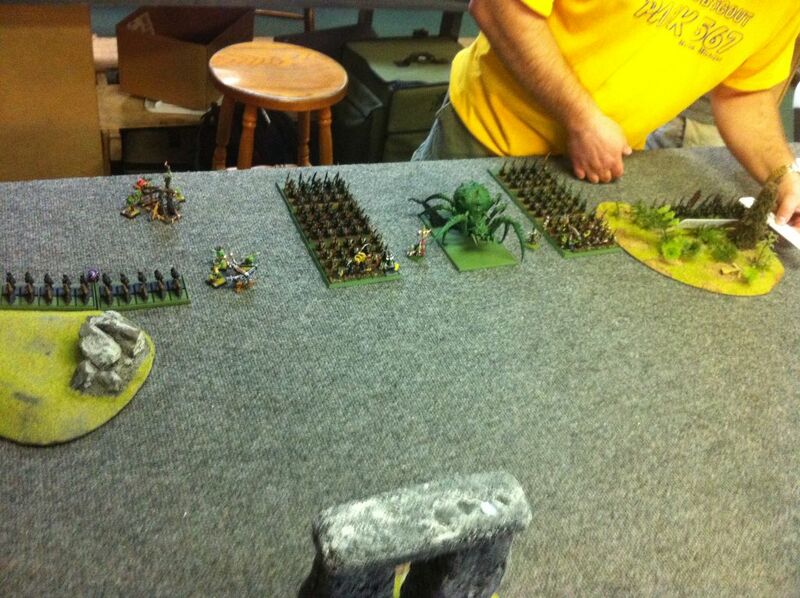 The Warriors brought 2 blocks of Tzeenth Warriors, a Warshrine, and 2 Heroes including a BSB. Unfortunately for Robert I was easily able to use my vastly higher numbers to overcome his small list. Early on the HPA rolled triple 6's to move at an angle but still towards the WoC, opening him up for a charge. He stayed Stubborn, only to again get charged by the Warshrine. Again he stayed Stubborn, with 1 wound left, in time for the Plague Furnace horde to charge in and break through. The Warrior block with characters and the Warshrine were eventually both run down. Game 2 vs Orcs and Goblins. 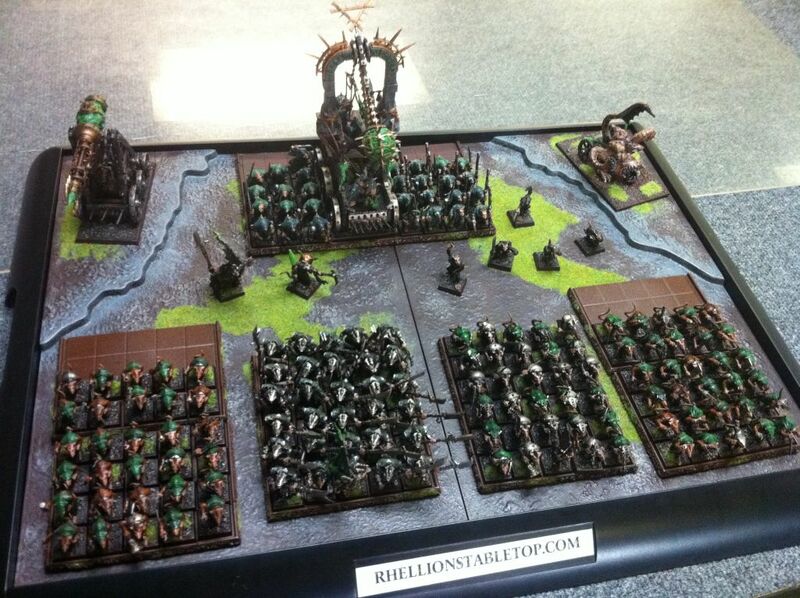 Game 2 was vs a full Goblin list that had a lvl 2 Night Goblin, lvl 1 Goblin, and 3 Goblin Heroes (inc BSB). There were 2 50 night goblin blocks, 2 20 night goblin archers, 8 total fanatics, 2 bolt throwers, a rock lobba, and an Arachnarok. I had the lick of rolling Plague for my Priest this game, and it would greatly effect the outcome. First turn my Gutter Runners were able to kill the Lobba with 10 non-poisoned shots, which was lucky. The Cannon put 3 wounds on the Arachnarok... but my opponent held back as I advanced. 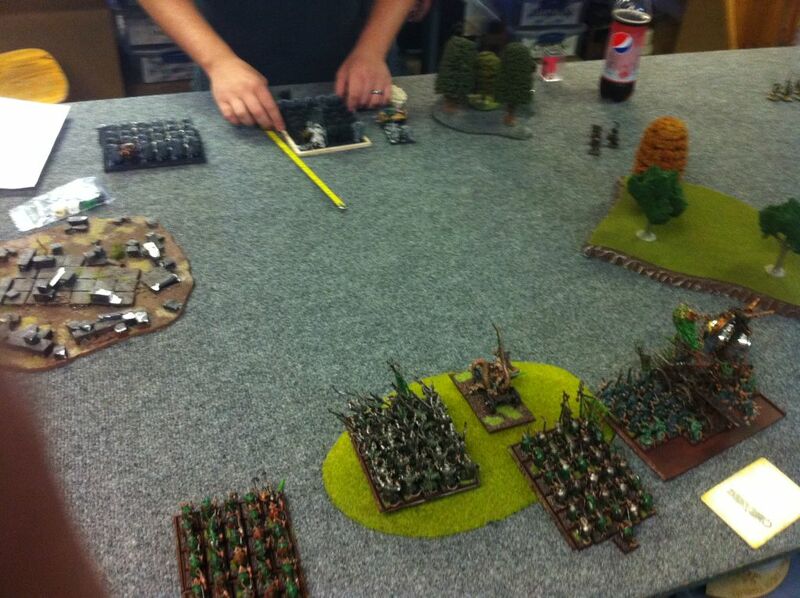 Turn 2 I got off Plague and killed about 70 Night Goblins across both units. Lots of failed panic tests later (the scenario rules also gave both armies -1 LD this turn so I knew to press the action) I was soundly in control, and by the third turn my opponent conceded. I was able to avoid the majority of the fanatics and take apart the rest. Game 3 vs Orcs and Goblins. A more varied list, this game had both Orcs and Goblins. Orc Heroes, inc BSB, 30 Orc Horde, 40-50 Goblins with fanatics, 3 Trolls, 6 Trolls, Single Orc Chariot x3, Rock Lobba, 2 Doom Divers, 2 Mangler Squigs. I thought it was a solid list, and I knew I wanted to get my Plague Monk horde in against the Orc horde. Their lack of serious army meant I knew i could perform well against them. The scenario rules were to pick up tokens, and not about any victory points, though, so I focused on the objective first. I set up on the line in Meeting Engagement deployment and started gathering tokens. Early on I charged my HPA into the trolls, and lost the HPA quickly. After that I was able to survive artillery bombardments, panic off the trolls with cannon fire, and run down the orc horde with the furnace after lowering it's numbers through shooting. I kept my units alive and used low O&G leadership to my advantage again for the win, and the Overall 1st place in the tournament. I thought the event was a lot of fun, and an interesting change of pace. It makes you focus on different tools when you can't take a Lord for high magic support. While I did have 2 giant threats, I still outnumbered every army at the event except the Goblin list I fought in the second game. It was a good break from cutthroat 2400 point tournaments to play in a fun, smaller scale event. Coming up, I have a 2000 point tournament on September 3rd I am running at Pandemonium Games in Garden City, MI. After that, Core Comp in Chicago on September 24/25th! How do you panic trolls? Aren't the ITP due to being stupid? It seems as if the rules were stacked a little, but maybe I am just looking at it from a 40K perspective. No lords seems like it would be a major challenge for some armies. Torpored, I don't recall if they fled from a combat or if we played wrong and it was actually panic. I do remember him only taking 1 stupidity test the entire game, and failing it. The rest never happened so after that one we probably both forgot and played them as if they didn't have it. SeerKarandras that is an interesting way of looking at it. But at 1500 points you only have 375 points to spend on Lords, so some armies may already be at a disadvantage by either not having Lords they can even field effectively, or at all. And at such a low points level they can be game defining.